IN RESIDENCE: Canadian glass artist Cedric Ginart fires up a new artwork. Two Canadian artists will blow into Drysdale next week to demonstrate their skills at the town’s Festival of Glass. The pair’s artists-in-residence role would require the first trip to Australia for Montreal’s Cedric Ginart and Karina Guevin, organisers said. The pair would conduct More is Better workshops at Drysdale’s Cafe Zoo on 13 and 15 February, the organisers said. 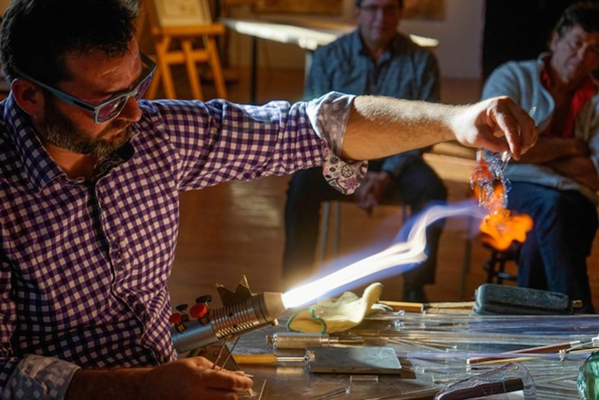 They would then join Murano glass master Davide Penso in a Twilight Flames “spectacular” of glass blowing and sculpting at Curlewis’s The Range from 6.30pm on 16 February. The Canadian artists would “round off their stay” with a Torch and Talk evening of demonstrations and conversations at Café Zoo from 5.30pm on 18 January. This year’s festival would also feature a fourth annual Historic Bottle Evaluation at Drysdale’s Courthouse from 10am to 3.30pm this Sunday, the organisers said. The organisers expected about 80 “hopefuls” to attend the valuations. “In previous events people have brought in some real treasures, which fetched record prices at subsequent auctions,” they said.